If you live in Delaware or eastern Maryland than you should try this route. The Lower Susquehanna River Tour is marked clearly as all Maryland state scenic byways are. It runs from Perryville, MD through Port Deposit, Maryland , across the Conowingo Dam to Havre de Grace, Maryland. Diana and I had the perfect day last Sunday riding up and down the Susquehanna on our motorcycles, just the two of us. We put on 130 miles round trip from our house, took some nice pictures and had a great lunch. A good ice cream too! The Susquehanna River is the largest non-navigable river in the United States. It pours 19 million gallons of fresh water into the Chesapeake Bay every minute. At some points it is 1 mile wide. At the end of the river where it meets the Chesapeake Bay you have Perryville, MD on one side of the river and Havre de Grace, MD on the opposite side. The scenic byway starts at the very beginning of Frenchtown Road in Perryville. From there you merge with Rt 222 and enter into Port Deposit, Maryland. We stopped in Port Deposit to take some pictures and had an ice cream. We found an ice cream shop called Shiver Me Timbers which had a tropical island pirate theme going on. The bananna split was very good! More Harley Davidson Fashion! Now I understand what Harley Davidson is all about! Harley Davidson Fashion Show? Does anyone find this disturbing? Gee, I hope the wind in my hair doesn’t muss up my hair. The first time I wore my First Gear Sierra nylon rain pants they melted onto my chrome exhaust pipes just a HOG’s whisker past the heat shield. I was pissed! FLHX Dave from the Road Grits Cafe came to my rescue with another one of his now famous product reccomendations. See that nasty black plastic? At the time I was more amused by the product name: Blue Job. Shortly thereafter I wrote a post on the product but was still focussed on the amusing name and partly goofing around. Then the owner and inventer of Blue Job contacted me and we got to talking about the unique qualities of Blue Job. Blue Job was originally invented as a polish for valuable gems. Unlike traditional chrome polish Blue Job is non abrasive and does not create swirlies. It is a deoxidizer and will take the blue out of heat stained pipes. It comes with a special non abrasive cloth similar to a gem cloth that will not scratch. Jeff was kind enough to send me a Blue Job care package which included some Blue Job for me to try out. So I tried it! 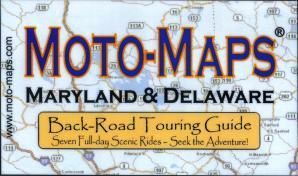 Keith Myers, President and Founder, of Moto-Maps didn’t want you all to wait till June for me to test and review the Moto-Maps system on Road Captain USA… so he sent me the Delaware & Maryland Moto-Map Back Road Touring Guide along with a Map-Sak. Diana had to go to Baltimore Saturday so I took the opportunity to try the only Delaware Moto-Map route. It’s called the Red Ride and is documented as being 210 miles and taking approximately 5 hours. I measured 250 miles in 7 hours. After riding in the rain in staggered formation with a passenger for three days straight the previous weekend I needed to get out on the road all by myself unrestrained for some 96ci V-Twin therapy! No worries, just me and the pavement! I stripped all touring accessories off the bike and put the compact Stop & Go tire repair kit in my riser bag. My bike felt feather light as I backed it out of the porch-garage. Without a passenger, loaded saddlebags and two tons of raingear I guess it should feel lighter. Ah the acceleration! All stress from the past work week melted away when I hit the throttle. For those of you who read my January 25th, 2008 post titled Dyna Touring Bike – 2 Bikes In 1 you know I have been adding only detachable accessories to my Harley Davidson Dyna Low Rider motorcycle. Without the accessories the Low Rider has a chopperesque look but with the accessories it looks like a touring mount. The best of both worlds! I call my motorcycle The Transformer. 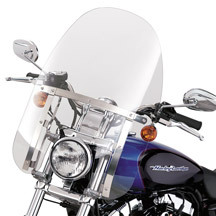 The latest accessory is this Harley Davidson hard coated polycarbonate windshield. The retail cost of $340 was an issue for me. A fellow HOG member offered to loan me his new shield for my trip to Pennsylvania. I wasn’t going to take him up on the offer until the weather report started to scream RAIN! Fortunately for me, my friend decided to trade in his Dyna but kept the shield. He sold it to me for a price I couldn’t refuse!